Quico says: The sun was setting by the time he got to the farm gate, so it wasn’t immediately evident to Kenneth that the guys loitering there were soldiers. Sure, they were toting assault rifles, but they were wearing plain olive-green t-shirts over their camouflaged pants. No uniforms, no insignia, nothing like that. Blank stares. Turns out the flunkies who’d been sent to expropriate this particular farm had no idea that, alongside their agricultural business, the old owners ran a posada – a kind of farm lodge for tourists. Even blanker stares. Of course, if the soldier didn’t know about the posada, he certainly didn’t realize that its location – just outside Valencia – made it a favorite lodging place for dog breeders, owners and handlers heading to last weekend’s big Pedigree Dog Show there. Kenneth had been driving for hours and hours by this time, having toured Caracas to pick up the dogs and then taken on the massive traffic jam in Tazón before hitting the highway with 22 – that’s right, twenty-two – dogs in kennels piled in the back of his van. He was tired, and just wasn’t prepared for any of this…five minutes earlier, his mind had been entirely occupied with worries about last minute grooming and such ahead of the big show the next day. At this, the kids at the gate realized they needed to take this to their higher-ups. One of them headed into the farm. A few of minutes later, a fat army officer came out to Kenneth’s van to figure out what this was all about. Kenneth explained what was going on. Said he had no idea the farm was about to get expropriated. Showed the officer his printed out reservation. And the dogs. The officer looked over the reservation papers, looked over the dogs, thought about it for a second and then, to Kenneth’s astonishment, waved them in. Kenneth’s friend, who turned up a few hours later, had a rather rougher time of it. When he turned up, the soldiers had left the gate unguarded. A regular at that posada, he just jumped out of his truck and started trying to open the portón to the farm himself, like he’d done many times in previous years. Seeing this the soldiers freaked out, ran over, and started screaming at him to stand back, at one point holding their Kalashnikovs up to his nine year old daughter’s head as they shouted questions at him. “Coño, nobody told us they were running a posada here,” the officer said over beers with Kenneth later that night, almost apologetically. Kenneth looked at the fields all around, though, and something wasn’t quite jiving for him. “Ah, gotcha, understood,” Kenneth said, letting it slide. Staggered, Kenneth got back to tending his dogs. At the show venue, the usual community of dog freaks from all over the country had come together to show off their mutts. Kenneth’s story made for something of an amusing anecdote backstage. Not that he’d want to make too much of it, though. 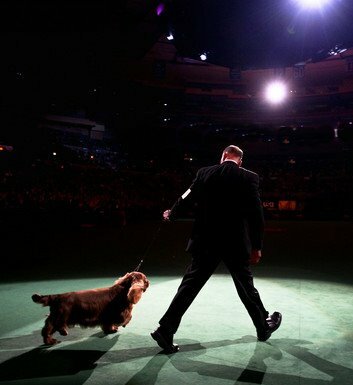 This is a dog show, after all. Non dog-related talk is strictly frowned upon at these things. Kenneth, along with his 22 dogs, spent two nights total at the posada. The last day, as he got ready to pack up his dogs and head back to Caracas, he couldn’t help but notice that the revolutionization of the farm had started. Literally the first thing the soldiers had been ordered to do was to take the whitewashed façade of the main farm-house, paint it bright red, and stencil a silhouette of Che Guevara onto it.